One hot and smoggy day during the summer of 2014, the corporate team was sitting around the office trying to grapple with what had just happened; we’d been tasked with putting together an itinerary highlighting the best of Beijing’s culture throughout its long and storied history. However, this didn’t mean simply eating at expensive restaurants and strolling through well-known tourist destinations. This specific expedition’s guiding theme was the application of technology in modern Chinese society; as such, we had to help participants experience the impact of technology from the perspective of both producers and consumers, all the while still learning a thing or two about historically significant aspects of Chinese culture along the way. It goes without saying that it would be a huge undertaking for anyone to put together an experience of this magnitude if given a few months to plan everything out. You can imagine our trepidation, therefore, in finding out that we were only afforded a few days to make it a reality. Excited by the prospect and driven by the desire to continually create new experiences, we got to work, tirelessly reaching out to our networks in an attempt to craft a program unlike any Beijing had seen before. After just over a week of steadfast determination, we had devised an ideal itinerary, and, upon the group’s arrival, we were able to deliver a unique and memorable experience that we hope will last with participants for years to come. Now, you may be asking yourself, who were the crazy folks that put us through this madness? This time around, it was none other than the mad geniuses over at Yahoo’s San Francisco campus. As part of Yahoo’s Associate Product Manager (APM) Program, APMs travel to global Yahoo offices to network with fellow staff members, key stakeholders, and partners to learn about regional markets and experience local culture. This trip is an integral part of the two-year APM training program and provides Yahoo’s future product leaders with a unique opportunity to engage with business leaders, colleagues, and consumers in different regions around the world. 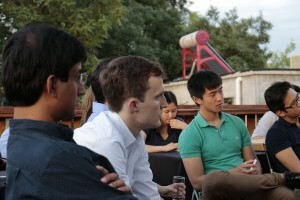 The team includes some of the most promising product engineers at Yahoo and Silicon Valley. 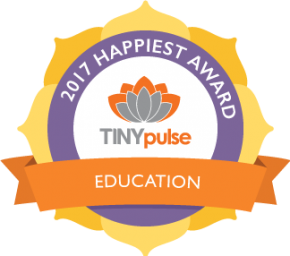 It was such a pleasure to work with them and we were thrilled upon hearing the news that the 2015 APM class would be joining us this year as well. When we got the call earlier last month, we immediately went back to work. We didn’t want to just simply replicate last year’s schedule. With that being said, however, we were sure to include elements that made the 2014 trip a success. One of these inclusions was a speaking panel, the focus of which was the technology and start-up environments in Beijing and the Greater China region as a whole. For this event, held at our courtyard near Beixinqiao, we invited some major players in the Beijing tech sector to help provide a better idea of the current state of the industry. The speakers at the event truly ran the tech-scene gamut, ranging from start-up gurus to video game developers to WeChat e-commerce services providers. Through sharing experiences from their own careers and fielding questions from the brilliant Yahoo minds, the panelists gave the APM class excellent insight into Beijing’s start-up culture, and we greatly appreciate their input and participation. One doesn’t have to live in Beijing for very long to understand the importance of baijiu in Chinese culture as well as the role that it plays in both business and personal relationships. It was therefore our duty to give the APMs, as budding young businesspeople, at least a taste (both literally and figuratively) of this part of Chinese society. In order to do so, we enlisted the help of our friends at Capital Spirits. If you haven’t had the chance to check them out yet, we’d strongly recommend doing so; Capital Spirits is one of the world’s first bars dedicated solely to the promotion of baijiu. Nestled within 大菊胡同daju hutong (just down the road from our own cozy courtyard) in a restored shop house designed by international Greek architect Anna Pipilis, Capital Spirits features a relaxing environment with a taste of Old Beijing. 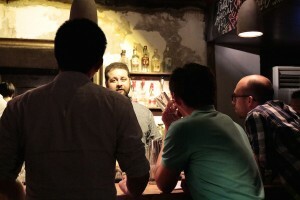 The bar has been featured in NY Times 36 Hours in Beijing, Conde Nast Traveler’s A Guide to Beijing’s Hutongs and Winner of Time Out Beijing’s 2014 Specialist Spirit Bar. The APM group was treated to an excellent tasting led by David Putney, an expert baijiu educator, and got the chance to try out a few different selections from the four main kinds of baijiu: rice aroma, light aroma, strong aroma and sauce aroma. We had an awesome evening and would really like to thank Dave and the entire Capital Spirits team for making it happen! 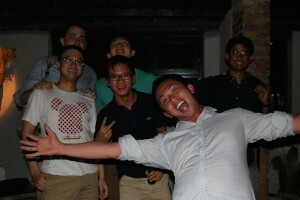 After spending days in engaging meetings with some leading names in China’s tech scene, the APMs were ready for a slice of some Beijing cultural staples. The group traversed (and slid down) the 慕田峪Mutianyu section of the Great Wall, had lunch in a farmhouse out at 天仙欲Tianxianyu village, and took a tour of the 798 art district. In addition, with trusty guide Jeremiah Jenne at the helm, the APMs experienced Beijing’s more imperial side, taking tours to the Summer Palace, Urban Planning Museum, Forbidden City, Tiananmen Square, and Jingshan Park. A regal feast at the Manchurian-themed 那家小馆 Najia Xiaoguan served as a fitting ending to the group’s journey through the old city. Any trip to Beijing would not be complete without engaging with the local food culture, and this program was no exception. After a long day of sightseeing, we invited the APMs back into our home for a Hook ‘n’ Cook culinary competition. The group broke down into teams of two; each team was given a recipe that highlighted a different region in China and had an hour to cook up their dish. Although the APMs had only been in China for a few days, we were extremely impressed with their culinary offerings. The dishes were delicious and truly captured many of the subtle flavors that distinguish different Chinese regional cuisines. In putting together the itinerary for this summer’s trip, there was one element from last year that was a definite keeper this time around as well: bargaining at the Silk Market. Heralded by many as the epicenter of fake, and occasionally, non-fake goods in Beijing, anyone traveling through town will tell you that the Silk Street market is a must-stop location for anyone looking to learn how to bargain in China. In order to allow the APMs to utilize their business negotiation skills, as well as the list of new Chinese phrases that they just learned, we put together a special challenge for the group. The contest was broken down into a number of different categories; best deal, best fake, speediest bargain, even most linguistically talented shop keeper. In two hours, the group bargained, haggled, and bartered their way to some amazing deals, and also walked away with some hilarious stories to bring back home. In addition to the time that they spent in Beijing, this year’s group traveled to Taiwan and Israel as well. We wish the best of luck to this year’s Yahoo APM class as they grow and develop into the leaders of tomorrow, and we look forward to welcoming the incoming group next summer! Whether it’s exploring the capital city for the first time, or bringing your Beijing-based team out to more remote destinations throughout the Middle Kingdom, we’re always up for the challenge! 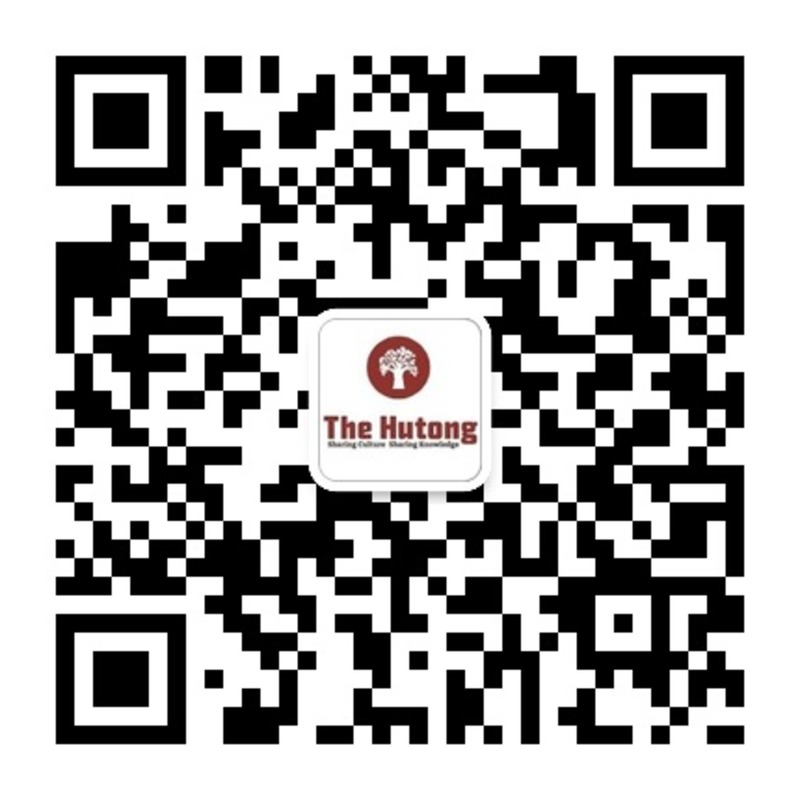 Check out more about our corporate retreats here or contact us by phone at +86-130-3108-2635 or by email at corporate[at]thehutong[dot]com for further information. 做个有知识的好汉! How Climbing the Great Wall will make you both Great and Wise!